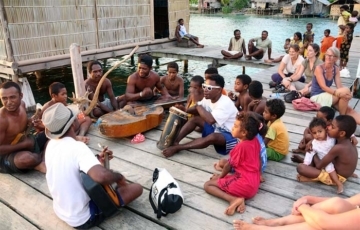 Raja Ampat health and medical FAQ - What visitors need to be aware of. First of all, we want you to know that we’re not qualified to give health and medical advice and this Raja Ampat health and medical FAQ article isn’t intended as such – it’s provided only as a starting point for further investigation. Raja Ampat is a tropical wilderness area and like any environment of its kind, poses risks to your health that need to be assessed. You should consult a health professional for expert advice on any points of concern. Travelling with a first aid kit is recommended, as the nearest hospital is in Sorong, a few hours’ travel by boat from the guesthouses and locations covered by this site. Is there malaria in Raja Ampat? Yes. Despite what some sources (and many local people) will tell you, malaria is present in the islands. That said though, the risk at homestays on Mansuar, Kri, Gam and Arborek is relatively low due to the absence of large numbers of human carriers and (in most place we’ve stayed at) surprisingly low mosquito populations. Although malaria transmission rates are currently low in the Raja Ampat islands, wearing repellant and appropriate clothing to avoid bites is a must and anti-malarial medications are recommended. Doxycycline is often recommended as a good antimalarial and has the advantage of also providing protection against certain other bacterial infections, but you should definitely consult a professional for current recommendations before making a decision about malaria prophylaxis. Are there dangerous animals on the Raja Ampat islands? Although your chances of encountering truly dangerous creatures on land are very low, poisonous snakes and spiders do inhabit many of the islands, so care should be taken when exploring. Being a tropical environment there’s also an abundance of insects capable of inflicting bites, burns and rashes, so bringing a repellent and something to relieve those symptoms is not a bad idea. (Your chances of escaping without a single insect encounter are also very low!) If you’re going trekking or camping in the interior of the islands a guide is a great idea. Apart from making sure you don’t get lost, he’ll also point out any hazardous plants and make sure you don’t roll out your sleeping mat under a tree full of fire ants! Are there dangerous sea creatures in Raja Ampat? Sharks: Dangerous sharks are extremely uncommon – you’ve got a much higher chance of encountering one on the beaches of Sydney in Australia than in Raja Ampat. Saltwater crocodiles: Saltwater crocodiles inhabit Raja Ampat, but your chances of encountering one are very low. Saltwater crocodiles are territorial and favour rivers, river estuaries and mangrove habitats, so it’s safest to assume there could be one around when in these environments. Check with your hosts before exploring such areas: Your homestay hosts and guides would never let you enter a known risk area. Please note that in October 2018, an aggressive crocodile took up residence in the Kabui Passage. Entering the water there would be extremely unwise while the animal remains in the area. Seasnakes: Seasnakes are not uncommon and although some are exceedingly venomous, they are not aggressive. They are, however, occasionally inquisitive. Being the object of a seasnake’s curiosity is certainly going to feel threatening, but if you stay calm and don’t make the snake feel threatened too, everything will be ok. Again, being in the company of a good guide will help you avoid such situations. Avoiding harm from the dangerous smaller stuff is as simple as don’t touch! No matter how tiny and pretty something is (like a blue ringed octopus) or how soft or harmless it might look (like fire coral) you shouldn’t touch it. Asking for trouble if you do. Diving codes of conduct forbid touching for good reason. Many corals will suffer damage from even a light touch, so it’s best practice from both environmental and safety perspectives to not touch any marine creatures. You should never walk or stand on coral at any time, but if you’re exploring sandflats or limestone reefs at low tide you shouldn’t be barefoot. There’s lots of animals like stingrays and stonefish lying concealed in the shallows waiting for the water to return. 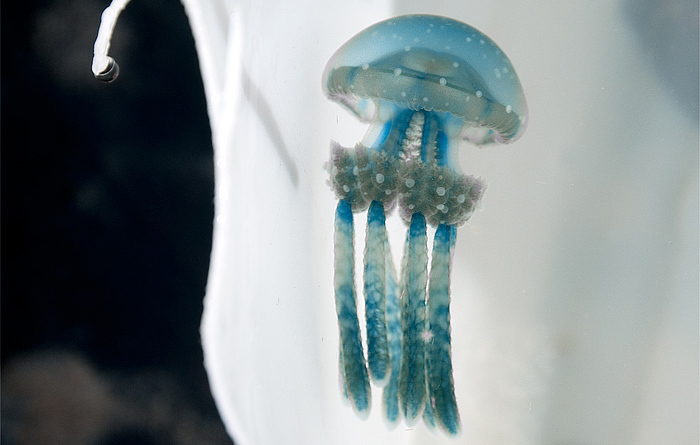 Finally, the most irritating (but not dangerous) critters in the ocean are invisible. Tiny stinging jellyfish. Wearing a lycra skin suit is the only guaranteed protection against them. What other health risks are there in Raja Ampat? Dehydration: It’s a hot environment. You’ll be losing lots of water and electrolytes and swimming in salt water won’t stop it. Drink lots of water, eat a little more salt than usual and have some oral rehydration salts handy just in case. Sunburn: High risk – cover up! Sunscreens should not be used, as they are proven to cause damage to coral. You might think that it won’t matter if you use the minimum required – after all, you’re only one person in a big ocean, right? Unfortunately research shows that even tiny amounts of sunscreen have a big impact on corals. Use sun-safe swimwear instead. Not only will you avoid reef damage by doing so, but you’ll be protected from those pesky tiny jellyfish mentioned above. Besides – don’t you think it’s ironic that even the best coral-safe sunscreen is still packaged in plastic? Plastic that, if left in Raja Ampat, will eventually end up in the ocean. Sun-safe swimwear will save you a pile of money in the long run too! Ocean currents: Raja Ampat’s tides create extremely strong currents in some locations. These can be very close to the beach in some cases and nowhere in Raja Ampat is completely free of them. Some currents are obvious, others can be invisible until you realise you’re moving quickly relative to the shore. The strongest currents are impossible to swim against, regardless of your ability or whether you are wearing fins or not. Always be aware of your surroundings when swimming or snorkelling. If you are not a confident swimmer and are not swimming/snorkelling with a boat nearby, then it’s safest to only enter the water on the slack of the tide. Insect bites: There are a lot of insects in Raja Ampat that can give irritating bites, but sand flies are the worst in our opinion. They are virtually invisible, exceedingly tiny, black flies that are common in many beachside locations. They most commonly attack at dusk, usually (but not always) on your lower legs and arms. The bites take several hours to appear, are incredibly itchy, and last for days. Because of the delayed reaction, many guests wake up at night and assume they’ve been bitten by bedbugs. We’ve never known of a single proven infestation of bedbugs in homestay accommodation. It’s much more likely that sandflies were the culprits. It’s good practice to liberally apply an insect repellant late in the afternoon after your last swim! Gastrointestinal diseases: We’ve been lucky and have never contracted any, but again make sure you have some rehydration salts and basic medicines on hand. (Consult your doctor regarding appropriate medicines before you go.) Anti-diarrhoea medicines like Imodium are best taken only if you have to travel – they only treat symptoms, not causes. Drinking only boiled or otherwise purified water will greatly reduce your chances of stomach troubles. You can read more about drinking water here. Skin and wound infections: You should clean and treat even small wounds immediately with an antiseptic, and then examine them regularly for signs of infection. Especially if they are coral scrapes, which are notorious for going septic. Keeping wounds dry until healed is also good practice, but it’s a big ask when you’re on a short stay in the islands. Fungal infections love a tropical environment too, so you might want to consider having some antifungal medicine in your first aid kit. A cautionary tale… My partner suffered a couple of small grazes in a boat landing and a blister from sand in footwear, all of which became infected after a few days. (There was no way she was going to stay out of the water!) The infections didn’t respond to treatment with iodine or the other antiseptics we had to hand and by the time we returned home the wounds were looking distinctly yellow. It turned out she had a staphylococcus aureus infection and it had begun to spread to every other small break in her skin by the time she sought treatment. It was a big surprise – I always thought hospitals were the high risk environment for golden staph, not pristine tropical islands! Amber’s infections were quickly beaten, but it took a strict daily regimen of dressings, keeping them completely dry and the simultaneous use of three different antibiotics to do it. You should definitely seek diagnosis of any infections characterised by bright yellow pus, resistance to treatment or contagion. No matter how small they might be. Golden staph’s not to be trifled with – it can kill. Ear infections: Spending a lot of time with water in your ears in the tropics raises the risk of ear infections, so if you’re concerned pack an appropriate medicine. Japanese Encephalitis and Dengue Fever: These mosquito-borne diseases have been reported from Raja Ampat. You might want to consider vaccination for Japanese Encephalitis. Avoiding mosquito bites is the only protection available against Dengue Fever. TB: Raja Ampat is not a high risk area for TB, but it’s worth bearing in mind that tuberculosis is resurgent worldwide and particularly so in Asia. Be aware of its symptoms, avoid close contact with any you think display them and seek medical attention immediately if you develop any. Tropical diseases: All tropical environments harbour parasites and pathogens not found elsewhere. You’re extremely unlikely to come into contact with any of those during a short holiday in Raja Ampat, but if you suffer any persistent or recurrent symptoms that can’t be diagnosed or aren’t relieved by standard medical treatment – even if those symptoms appear months after your visit – you should consult a tropical diseases specialist. What if I need urgent medical treatment in Raja Ampat? Rumah Sakit Angkatan Laut naval hospital does not provide western standard facilities, but operates a 24 hour emergency care facility and is probably the best option for initial treatment of serious illness or injury. Gynaecology: If you need a gynecologist, Dr Indira at the Rumah Sakit Umum Herlina in Sorong speaks excellent English and has been recommended to us by visitors. (Thanks Sara!) In March 2017, Dr Indira could be contacted at 081288269634. So do I need medical insurance for a holiday in Raja Ampat? An emphatic yes to that if you’re going to be diving. Divers should also definitely get insurance which provides for emergency medical evacuation. Further information about diving safety and insurance can be read on our Diving with Raja Ampat homestays page. If you’re not going to be diving and you can’t afford a policy that covers you for emergency medevac then you may decide insurance isn’t warranted. Like most insurance though, you may well not need it, but you’ll be in dire straits if you do and you don’t have it. Is that everything I need to know? Nope – it’s just the basics. If you’re conscientious, want to cover all possibilities and/or are planning an extended visit to Raja Ampat you should definitely do more research and talk to a tropical medicine specialist. Nothing we can tell you, except that you shouldn’t read this list and decide Raja Ampat’s just too dangerous a place to visit! With the exception of malaria and the availability of medicines and western standard hospital care, everything on this list is just as applicable to cities like Darwin in Australia. If you also except the possibility of encountering a saltwater crocodile (but add back in a low risk of malaria), these risks also exist in places like the Thai Islands and Bali where millions of people safely holiday every year. Go! You’re going to have a great time! Hi, we am looking at traveling to Raja Ampat with our 2 children. Can you please let me know if the tiny stinging jellyfish you mentioned in the write up above are there all year round or is there certain times of year that they can be avoided? In our experience, while those stingers are not always present in any particular location, they can be encountered at any time of year. The homestays that have both onsite dive centers and great house reefs are all on Kri. You can find those quickly by simultaneously applying the Location>Kri and Activities>On site dive center filters on the accommodation page. Is zika and Japanese encephalitis present or at risk in raja ampat? As advised above, Japanese Encephalitis is present in Papua. Zika transmission has been reported in Papua New Guinea, so it’s reasonable to assume that it is also present in Indonesian Papua. I am in RA right now and wanted to ask if you’d heard of any confirmed cases of Zika virus either in RA, Sorong or West Papua? We haven’t heard of any confirmed cases of Zika anywhere in West Papua, including RA and Sorong. I was wondering what te best islands will be to stay during July-August concidering the weather/currents in that season? We like snorkeling and don’t dive. As mentioned on the weather page, the north shores of islands are best protected on the windy days at that time of year. Beyond that, there’s not really any weather-related reason to choose one island over another. Rabies exists in West Papua, so it seems likely that the vaccine would be available there, but we don’t know for sure and we don’t know who would keep supplies of it either. It would be far more likely to be available in a hospital in Sorong than in the Waisai hospital. You could try asking this question in our fb Travellers’ Forum: A member of the group might know. Sorry, but we don’t know of a specific doctor to recommend for that. We’d suggest visiting either the new Siloam Hospital or the Angkatan Laut Naval Hospital (linked above). Thank you for this very helpful information, I keep getting mixed messages about taking malaria medication, so I think I will take it! Looking forward to an amazing dive trip to this beautiful remote place. Wonderful information on your site! We were curious about the risks of contracting Dengue fever around the islands? Also do the homestays charge full price for a child under 2? We haven’t heard of there being any heightened risk of Dengue in Raja Ampat, but it’s reasonable to assume that some level of risk exists. As so few people travel to Raja Ampat with children that young, we don’t know what homestay policy is regarding prices, but would be very surprised if they charged full price. You’ll need to contact the homestays concerned for confirmation though. Great website with lots of essential information. Me, my husband and two kids (4 and 1,5 year old) are planing on visiting Raja Ampat (4 different homestays during 6 weeks from nov-mid december). Now that the date is closing in we started reading all the information again to prepare all the “stuff” we need and are getting cold feet specially because of the one year old (wondering if we might be risking a bit too much). We tried to find posts on the web of other families that have travelled with kids but can’t find anyone who has brought so young kids. My question… Do you know if it’s common that people bring their young toddlers to the islands? Ps. Previously to raja we will be staying in Bali. We have already started to take all the necessary vaccines, bought life vests for the kids, first aid kit and so on, but are still a bit scared and would like to hear if you have some advice or comment? It’s rare to see visitors travelling with such young children in Raja Ampat, but we have met a few other couples who have done it. The risk of malaria is the only potential health hazard in Raja Ampat that isn’t present in Bali, and people safely take toddlers to Bali all the time. In all likelihood it would be fine, but – as mentioned above – high quality medical care is unavailable in Raja Ampat if you were unfortunate enough to need it. We stayed in a rustic homestay on Pulau Kri (Lumba Lumba) when my boys were 7 and 10 years old. We never took special vaccinations nor prepared for malaria. I didn’t really notice signs of risky mosquito borne viruses. Places were kept reasonably clean, airy without stagnant water. But we generally took precautions around getting bitten – natural repellents and nets over the beds. Usually we too tired to stay up when the sun went down during the time when mosquitoes were the worst. I think your question was mostly around this type of answer. But if you were asking more generally what it’s like with small kids, then it I would say it depends on your kids and the homestays you’re planning to stay at. You could compare it to back-country camping in a Swedish forest. We’re from Canada – lots of lakes, rivers, no electricity, beaver borne viruses in the water, places only accessible by canoe where the biggest risk is accidentally chopping your finger off when preparing firewood and no clinic except after 1 day journey. It was normal for us to take our toddlers into the wilderness because we’re comfortable with their level of ability/activity in such an environment. If you’re good with that kind of trip – small kids near lots of water and rustic settings – then all should be fine. Hi and congratulations for your website, it’s a precious gem ! My husband and I will stay 2 weeks on Waigeo next February. We plan to discover the archipelago from there. I have a problem, I’am totally scared by stray dogs…I heard there’s plenty on the islands. Do they represent a serous risk to your point of view ? Big thank’s from South korea. In South Korea they don’t do the pre-exposure rabbies vaccination. In other words, they just do the post exposure rabbies vaccin when you have been diagnosed. So, after a bite (the worst scenario) in Raja Ampat, is it possible to get the post exposure vaccination in R4 or in Sorong ? or do we have to fly to Hong Kong or Singapore ? I know it’s silly but the mondial health organisasion says that all West Papua is a highly risky place for rabbies. Hi, I’m on this page as I’m too going to Raja Ampat in Feb. I dont have first hand experience with Rajas dogs but I’ve spent over a year in other southeast asian countries and the best defense I found against stray dogs was to always carry a soft waterbottle full of water and squeeze/propel the water (not the bottle) at them if they get too close. It keeps them back and often freaks them out so much they leave. You can also squeeze the water out quite a long distance so you dont have to let them get too close before taking defensive action. Throwing water on a dog has always been the best way to stop them fighting so without thought I used it late one night in Cambodia while being trailed by about 10 dogs. Very happy with the result which was wet dogs and safe me. Used the technique a few times again after that to relieving results! I’m wondering if there is a stinger season (for marine stingers) or if it’s an all year round issue. The islands look fantastic, we’re certainly planning a trip! We don’t know for sure, but imagine that you could encounter them any time of year. In our experience they’ve been more of an annoyance than painful though. I am planning to go to RA in Dec . Is that season is malaria prone. Secondly I am a novice in diving just dived else where in thiland two/ three times. (PADI I did in 2010 in Andaman seas). I am planning to go with Raja Ampet Dive Resort for few shallow dives ( not more than 10Mdepth) and where current is not there. With this my question is the dive school is experienced to take care of novice diver like me. Is it safe to dive in shallow depth where current is not strong. Malaria risk is the same all year round as far as we know Praveen. We don’t know anything about resorts so can’t answer your question about diving safety there. Wobbegong Dive Adventures specifically caters to novices. See this diving safety information. Can you tell me what kind of snakes live at Raja Ampat? Sorry Vera – we can’t! They’re around, but we’ve never seen one and have never met anyone who has either. The internet or a reference book about Papuan fauna would be your best bet. My husband and I are planning to stay in Raja Ampat for the week in October 2016. Do you have any updates or changes on infection disease situation? What kind of vaccination we may need? No updates to above information. You should consult a doctor about which vaccinations are recommended. Could you tell me where the nearest dentist is? In sorong? Now I’m a bit worried it might happen while I’m in Raja Ampat and there’ll be nobody around to fix it. 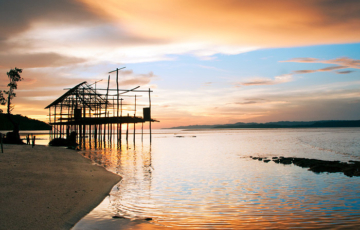 Yes – the nearest dentist is more than likely in Sorong. If we were you though, we’d visit one before leaving home to try to prevent the problem! Unfortunately it’s not an easy to solve problem. Thank you for all this informations. We will be at Kri Island in 6 weeks for our honneymoon ! We are preparing our trip and have some security questions. Do you know wich kind of poisonous snakes and spiders can we meet on Kri Island ? We would like to walk on Kri Island to visit the village and the different places do you think that we need a guide all time to do that ? Our can we visit the island alone safety ? Thank for all your advices, i specify that we are not adventurers but only tourists who like beautiful nature – we do not yet amount ever gone in such a remote place. Hi Ben – and congratulations! Maybe we will be not go there without it… THANKS. Hi, thanks a lot for all this valuable information! Do you know if there is a risk for rabies? My doctor recommended a vaccination, but on your site I couldn’t find any information on this topic. We recommend you follow your doctor’s advice! 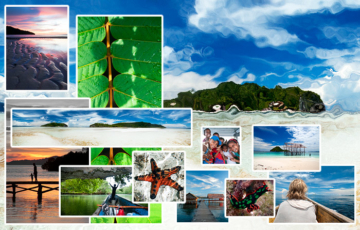 Thank you Stay Raja Ampat for compiling all this good info, on this page and the others. Perhaps you have this information somewhere else and I just haven’t found it yet, but as a suggestion/request, could you include phone numbers for the relevant emergency agencies and services that should be contacted in case of an incident? Is there much point in dialing the emergency number from a mobile phone (assuming reception)? Maybe it’s good to include this info on the diving page too, i.e. Who to call in case of a missing diver? We would certainly post this information if it existed. Unfortunately, no emergency services are available outside Waisai and Sorong. In the case of a missing diver, your homestay dive guide would mobilise the resources of the Homestay Association and local communities to mount a search. No – a Surat Jalan is only required for other areas in West Papua. Do you think it’s a good idea to travel with a 4 year old child? Or would you recommand to wait some more years? Tough question! It would depend on the child and it’s obviously your call in the end Vanessa. We’ve seen young children accompanying their parents in Raja Ampat and have never heard of any problems, but there are risks and there’s very little medical support in the case of a serious accident or illness. Do you think is safe for pregnant women to go there? Is malaria a true risk? You’d be best to ask a health professional about those. I’d guess it would depend on how pregnant and the likelihood of complications. There’s no western standard medical care available if something was to happen. Malaria is definitely a risk, albeit a low one. Some say travellers are crazy for not taking malaria prophylaxis in Raja Ampat, but many on short stays choose not to and have no problem. We don’t presume to make recommendations one way or another – you really need to decide for yourself after consulting a doctor! how long does it take to get evacuated to nearest western standard medical facility while in Raja Ampat or Sorong? Hard to say ewm. It took 24 hours to evacuate an injured diver from Misool to Singapore a couple of years back. You’d have to assume a similar time from anywhere else out in the islands. Makassar is 2.5 hours from Sorong by scheduled commercial flights and would be the closest destination with decent hospital facilities.